a Class*y Collaboration: Gotta Love Educents! I've gotten some fabulous deals on educents....not the least of which have been some terrific bundles. Have you seen this bundle? It is completely jam-packed with goodies. I know it says that 3rd-5th, but 2nd grade teachers, there's tons in here that you can use, too! Seriously. You need to click over and check it out. There are 35 products for just $30! And I just added it all up......$112 worth of products for that $30! You can't beat that! If you've been looking for resources for Reading, Grammar, Math, Science, or Social Studies, you definitely want to check it out! I am super excited to be a part of this terrific bundle! 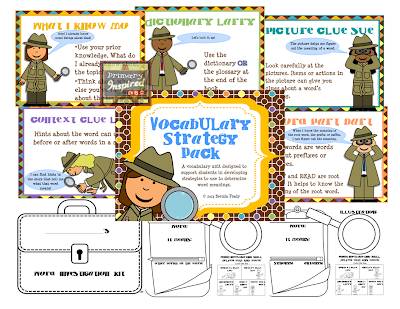 I know you will love my Vocabulary Strategy Pack. It focuses on 5 vocabulary strategies: using context clues, word parts, picture clues, background knowledge, and yes....a dictionary. Each skill has a corresponding character. 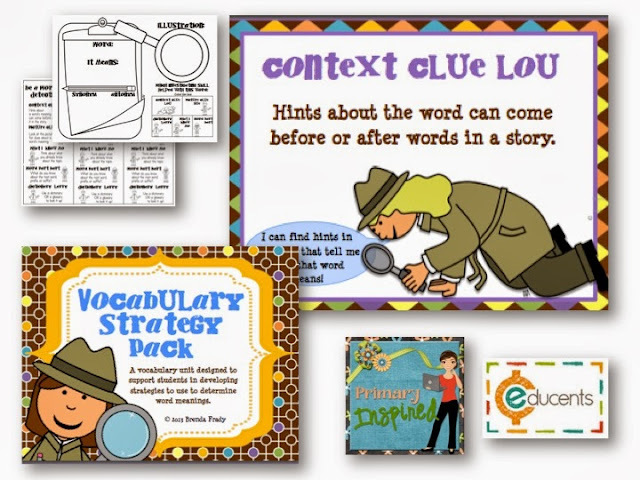 You'll also find graphic organizers, a cover to create a Vocabulary Journal, as well as bookmarks to help kiddos remember and use those skills as they read.